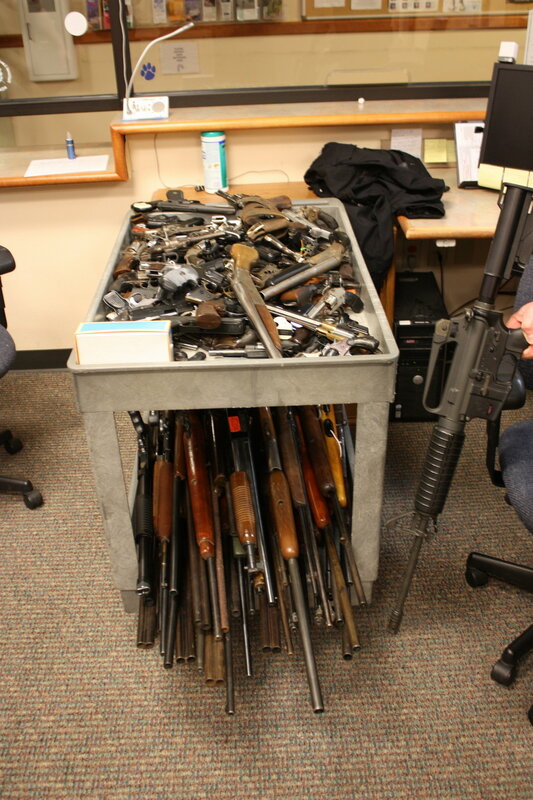 Two sawed-off shotguns and an assault rifle were among the 138 firearms the Newport Police Department said it collected Saturday as part of a “no questions asked” gun turn-in. Central Coast Cease Fire, an organization that helped organize the event, provided gift cards to those turning in unwanted firearms, officials said. The guns submitted on Saturday included 18 shotguns, 18 rifles, 35 semi-automatic pistols and 67 revolvers, authorities said. The department also collected 95 high-capacity magazines and accepted ammunition, according to police. Police plan on checking the guns’ serial numbers against state and federal databases, officials said, and any stolen firearms will be sent to the police agency in which they were reported stolen. There were two or three guns that are “of museum quality,” and the department will ask accredited museums if they are interested in the weapons, police said. All other weapons will be boxed and sent to the burn plant in Brooks for destruction, according to the department. Police said any unwanted firearms or ammunition can be turned in at the department year-round.